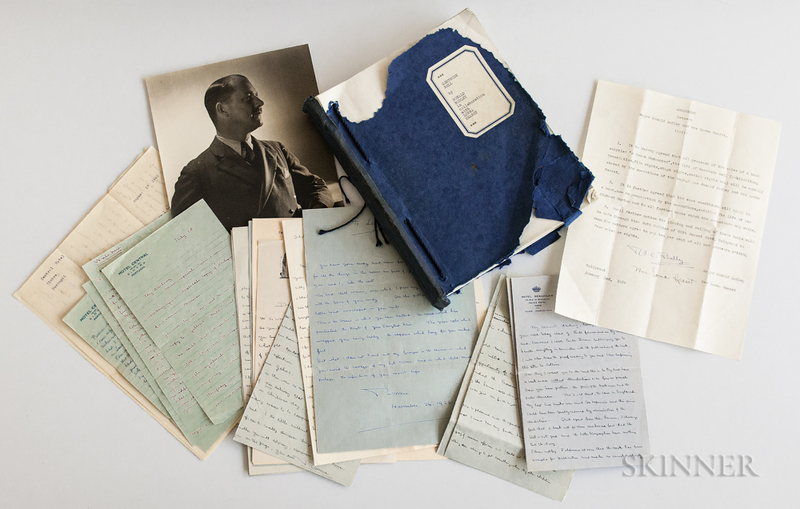 Bodley, Ronald Victor Courtenay (1892-1970) and Lorna Hearst (1902-1991) Large Archive of Material Related to their Biography of Gertrude Bell, and a Collection of Love Letters. Including: two 8 x 10 in. black-and-white portraits of Bodley, approximately thirty typed and handwritten affectionate letters, most multiple pages, all addressed to Lorna Hearst, c. 1939-1941; a large group of typed signed letters (more than fifty) from the London publisher of the biography, Gertrude Bell, Curtis Brown, Ltd.; approximately nine letters from their American publisher, Macmillan, including the signed publisher's agreement; fourteen pages handwritten by Bodley detailing corrections to Bell's letters; approximately thirty pages of retained typed carbons of editorial material sent by Bodley and Hearst to publishers; a large quantity of press clippings related to the book; a signed legal agreement between Bodley and Hearst regarding rights and publication, giving each an equal share; an uncorrected galley of Gertrude Bell; and a bound typed carbon of the original manuscript of the book.